Haredi educators are noticing that the age of marriage is rising. According to an article in the Hebrew edition of Mishpacha, only 10% of students in a particular seminary got engaged last year instead of the normal 50%. According to the shadchanim (matchmakers) quoted, only 5-10% of girls’ parents can afford to buy an apartment for the young couple in a low-cost haredi project. But the parents of the “good” bachurim (eligible men), are still hopeful, so they wait, while the yeshiva dormitories fill up. These kinds of articles always seem to pit parents of sons against parents of daughters. At least 90% of haredi parents, presumably, have children of both genders. Yet parents demand large sums for sons, even though the system bites back when it comes time to marry off a daughter. Maybe they think that the price of apartments will drop after the wedding. In the meantime, apartment prices are rising rapidly. According to the article, even those parents who diligently saved are finding they don’t have nearly enough. Families are larger and sources that helped previous generations, like Holocaust reparations from Germany and inheritances, have dried up. “Yerushalmim.” (Lithuanians in Jerusalem) $130,000 total, including varying amounts from both sides. “Sephardim.” If the boy learns in a Lithuanian yeshiva, he can get $50,000 and sometimes much more. In sephardi yeshivot it’s common not to expect financial help. Sometimes the parents only commit to the cost of the wedding and furniture. The Hasidim have it simpler, thanks to takanot. 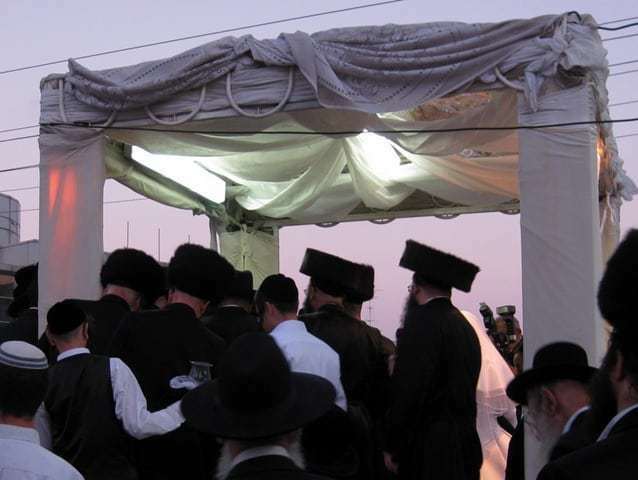 The rebbes of the various chassidic groups have set financial limits on all aspects of the wedding. Chabad opposes any gift of an apartment. Couples work as shlichim in Chabad Houses around the world, or live in cheap secular cities within Israel. Gur, Belz and Satmar have strict guidelines, with each side paying no more than $20,000. In some Jerusalem Hasidic communities, the parents provide $130,000 like in the Lithuanian community. Other Hasidic groups like Boyan, Slonim and Vizhnitz used to give $20,000 from each side, but now each Rebbe rules in a slightly different way. It also depends on whether the groom is planning to work, or stay in yeshiva. Hasidic parents in the US give $20,000 each and pay rent for 8 years. Americans in Israel, even if they have lived here for thirty years, are not interested in buying apartments for their children. They give a minimal sum to start out with, and expect the children to manage on their own. There is no discussion of the Lithuanian community outside of Jerusalem. One shadchan got a call from the parents of a 25-year-old woman, looking for a man with a health issue or a “small defect.” She’s a fine girl, but the parents can’t pay so they have lowered their sights. One of the shadchanim claimed parents who had a hard time getting the sum they demanded for their son are reducing the rates for the next son in line. A rabbi in Modiin Ilit said that he doesn’t know of any family that married off a daughter without getting charitable funds. And everyone agrees that it’s unreasonable to leave yeshiva to spend months in the US begging for funds to marry off a daughter. Many thanks to Rafi of Life in Israel, who scanned the original article for me. Bluke at The Jewish Worker first posted about it. Such a window into a different culture, my my! In Israel in general, is it usual for secular parents to help the children out with housing costs? It seems very strange (from a progressive Jewish American perspective) to pay for a man. My parents were initially very uncomfortable with the idea that my husband made less money than me. The idea of paying for a husband, who subsequently does not work but dedicates his life solely to study, would have absolutely horrified them. For how long has a down payment on a mortgage been the necessary price for a wedding in the haredi community? It seems…medieval. With needing 40% down in order to even think about talking to a mortgage bank, yes, even secular newlyweds often get help to buy a house/apartment. As a matter of fact, when my husband went to talk to the bank manager about down payments, the manager himself said to talk to our parents for help. I agree that parents usually help kids with apartment down payments here, though it’s more of a gift rather than a business transaction, as these shiduchim seem to be. I.e., no parents (that I know of!) would ever prevent their child from marrying someone because the prospective spouse’s parents wouldn’t pay. Rather, parents help their kids to the best of their abilities, a little more than parents in the US might. How do Haredim on government welfare afford these large sums of money? It’s interesting that you say Americans in Israel are not interested in buying apartments. When my husband and I got engaged, the first thing my future FIL (both families are MO) discussed with my parents was how much each would pony up for an apartment. My parents were a little taken aback, because they were planning on helping, but not such a lump sum as what my FIL was discussing. They paid in order to “protect” the shidduch and not make waves. I didn’t say that, the article did. Are your husband’s parents American? MO is different. I don’t know anyone who didn’t get help from their parents buying an appt. when they got married. We and many of our friends are still renting as we don’t have enough for a down payment. How are the parents going to shell out $20K? Its not like they have high paying jobs and are probably still makinghteir own mortgag payments. And have many children. Window to a different culture? More like window to a different planet. I am unmarried, in my early twenties, living at home with parents, and I pay rent to my parents. Nobody is going to be giving me any $1000 to get married. A lot of parents give a big chunk of help for the first apartment in Israel – religious and non-religious. There are a few reasons. 1. minimum down payment is 40% in many cases. 2. renting is not easy, because there are no rental companies, only private rentals. 3. there’s a mentality that you’re “throwing away money” if you pay rent. It was serious culture shock for my parents when my first sibling married an Israeli and they were told that standard practice was down payment or more. Their experience was that you might get a $20 check for your birthday, but once you were married, you were on your own. It is common for Israeli parents to help out with the apartment or even buy one outright, but it’s not as formalized as in the Haredi community. A woman I met told me that in the 50s, everyone was poor. When the European refugees started getting reparations, all of a sudden they were in a different class. It led to a lot of snobbery and resentment and ethnic tension, too, she claimed. But if you think about it, when survivors started to get all that money, there was no better investment than an apartment. The perception was, and people still believe it to be true, that apartment prices will never bottom out. from my experience and from what I am familiar with, among the Americans, there are some, usually in the more yeshivishe crowd, that buy or split the purchase of an apartment for the kids. That usually happens when they are roped into it and dont want to make waves, and want their kid to have the “good shidduch” and not be their fault for breaking it up. Another factor is when they feel like they need to fit in – this is only if the kid is marrying a yeshivishe Israeli. How does it work in the “dati leumi” community? Should I start advertising a kidney for sale when my daughters get to that age? After struggling to pay for 5 years of Hesder (less army time) at the same time as my other kids’ school, fees, our own mortgate payments etc etc., I don’t know how we’re going to pay for weddings. Buying an apartment isn’t even on the radar. The Sephardim appear to have an advantage in this context. But I get the impression from the “yeshivish” Sephardim I know in the US that they follow the general trend of the yeshivish group; and would extend support through several years of kollel. I love my kids dearly but will not be buying them apartments, as I prefer to have money for food in my old age. They will either have to marry money, earn money or move to a place where housing is very cheap. where do people get this type of money?! a friend of mine claims that the israeli disdain for renting is not logical and doesn’t make financial sense. is this true? Abba, yes. I believe your friend is right. If one has the money for a down payment it’s better to invest it and pay rent from the interest. The problem is that there are not always enough rentals available, and renters live in fear of getting kicked out. I heard in the name of r’ Yoel Titelbaum that winning wars is easy… buying an apartment here is a a real miracle. BTW It is not going to get any easier. The dollar will never recover, Every time there is a corruption scandal is real estate money, making sure they are covered, and to make things ever worse, once in a while we get a prime minister that gives away land.